First as a contestant, then as a guest, and now as a blogger…That’s right! Today, I'm talking about this year's Henley Challenge, which was held on Wednesday 1 March 2017. 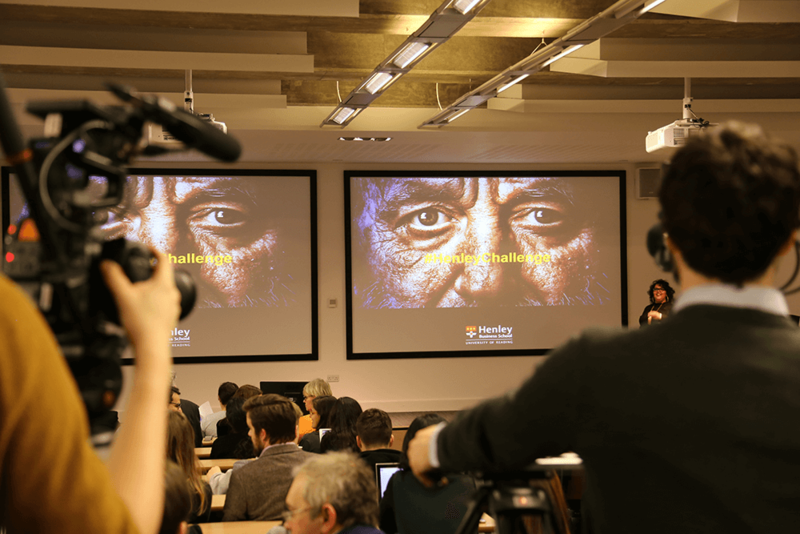 It was a night full of diversity – not just in the topics covered by the finalists, but also in the range of attendees, from visiting Sixth Form students to experienced academics and professionals. The event kicked off with a brief welcome by Deputy Dean Professor Ginny Gibson and a short talk by one of the event comperes, Naeema Pasha, who is also the Head of Henley Careers. Naeema reminded us of the wonderful community we have here at Henley and played a heart-warming video of our staff and students celebrating their accomplishments! As for the Challenge, this year's topic was "Social change… business gain", inviting applicants to present their views on how they believe having a social conscience in business also pays economic dividends. Susan Scripture-Shardlow, Executive MBA programme member drew a likeness between the private sector and a beast with no heart. It might sound harsh, but Susan's presentation was packed with optimistic and hopeful visions of "giving the beast a heart" so that it becomes more like the caring voluntary sector. One of her proposed solutions was giving the so-called "unemployable" people, like those with mental illness and disabilities, roles that they could be proud of. She advocated that companies whose culture is welcoming of all people is likely to improve employees' work ethic and their ability to work together, thereby improving a business's performance. Compelling, eh? (Spoiler Alert! Susan's point of view was favoured by the audience and won the grand prize of £1,000 – £750 of which will go to Susan's chosen charities). We can encourage participation by highlighting the added conveniences of financial technology, including not needing to remember a dozen passwords nor needing to physically go to a bank branch for help. Frank Gaymond, MSc Real Estate, took the stage next to talk to us about infrastructure! He pointed out that each and every one of us is a "product of social infrastructure", including the schools that teach us and the hospitals that heal us. Frank presented a solid argument on how investing in infrastructure might not only be the best investment in terms of the risk-return payoff, but also in terms of social gain. Why invest in a company you have no control over when you could build a school in your local neighbourhood? Frank also spoke about how crowdfunding platforms, such as Kickstarter, could help catapult infrastructure investment further. Ultimately, he argued, quoting Guatam Adami in the process, that investing in infrastructure gives investors more control over their money, grants them superior returns and also allows them to 'build their nation'. Fourth to present was another duo, Alan Melady and Natali Vitola Reyes on the Full-Time MBA programme (it was also Natali's birthday when she was presenting!) Their perspective was on the commercial aviation industry, in which they have both worked for several years. First, they talked to us about how flying is bad: busy airports, long delays, little leg space in planes, and most importantly, pollution – both air and noise. Then, they told us why flying is amazing: connecting people, employing 63 million workers worldwide, and allowing tourism to be the primary export for some countries. Basically, it's good for the economy, but maybe not as wonderful for the planet. However, the pair highlighted how being environmentally friendly and socially conscious in aviation is the key to more sustainable and accessible flying, which will increase connectivity between people and nurture relationships around the world. The flying industry has a "track record of innovation" and quickly improves itself, from economic mass production of airplanes to fuel efficiency, and will continue to do so. And finally, not only was the fifth presentation about chocolate, but there was real chocolate, too. Thanks to finalist, Alex Blanchard, an MSc student in Coaching & Behavioural Change, the talks ended on a sweet note. Alex spoke about the not-so-rosy future that we are headed towards if we continue to operate under the unsustainable practices we currently implement, pointing out that there will be mass extinctions, billions in poverty, gene pool shrinkage, climate change, widening gap between the rich and the poor, and of course, chocolate will become as expensive as today's finest caviar! With the help of a story about two imaginary characters representing a company owner and a CEO, Alex talked to us about how looking into the past – more specifically, 19th century Britain – could open our eyes to the fact that the companies that outperformed competitors were those who had a responsible, sustainable and forward-looking vision. He believes that companies need three things to make sure future economic and societal benefit is high, while (most importantly) chocolate remains affordable: long-term thinking, respect, and sharing. After our second compere of the night, Professor Adrian Bell, Head of the ICMA Centre, took the final round of questions, it was time to wrap-up the event and get started with the voting. The results were announced right after everyone enjoyed pizza and refreshments. At the end of the evening, Susan was crowned the winner. Her achievement and success, as well as those of the other finalists, were commended with pride and congratulations! Overall, the Henley Challenge 2017 went incredibly well, with special thanks being owed to the Henley Marketing team who organised the event fantastically. And with that, we say goodbye to this year's Henley Challenge and look forward to next year's!